Prime Minister Justin Trudeau is taking his government's balancing act between the economy and the environment on a western Canadian road show this week. However, the precariousness of his position between environmental groups, who want no more fossil fuel development, and the oil industry, which is a big driver of the Canadian economy, will be highlighted on the trip. Several hundred Trans Mountain pipeline protesters plan to give him a less-than-warm welcome at his Vancouver hotel Thursday night. Then on Friday, Trudeau is to visit Alberta's oil sands to tour a Suncor facility, a company whose CEO complained two months ago that Canada's regulatory regime and uncompetitive tax structure would keep his company from investing any further in this country. The Trans Mountain pipeline was approved by the Trudeau government in 2016. 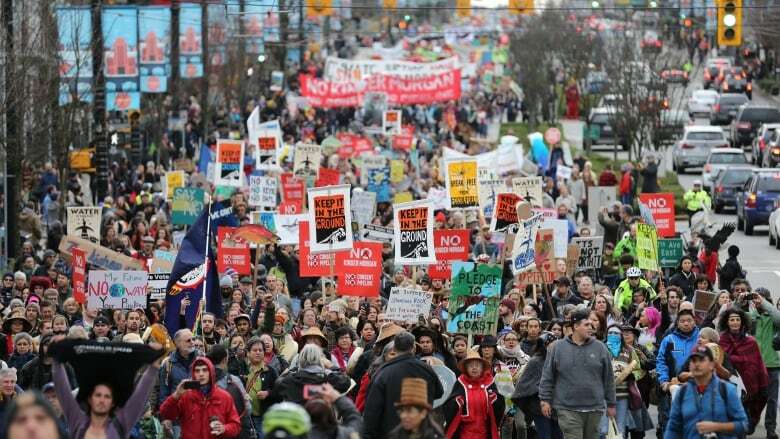 Protesters say it will raise the risk of oil spills in the Burrard Inlet and can't be completed if the government is to meet its climate change commitments to cut Canada's greenhouse gas emissions another 200 million tonnes a year by 2030. Furor over the pipeline has ramped up in recent weeks, with around 200 people arrested near Kinder Morgan's Burnaby, B.C. marine terminal in the last month; Trudeau faced protesters at a town hall in Nanaimo in February and their ranks have grown in the days since. Trudeau's western trip starts with a stop in Victoria on Thursday where he will meet with the coast guard for an announcement on marine safety and oil spill prevention. He has a clean tech industry round table in Vancouver later in the day, followed by a $1,000-a-plate Liberal party fundraiser in the evening. It's outside that fundraiser that several hundred, possibly thousands, of pipeline protesters plan to show up, banging pots and pans with wooden spoons to make as much noise as possible. "Our warning to the prime minister and to his wealthy donors is that building this pipeline is going to cost him in the next election," said Jolan Bailey, a climate campaigner with Leadnow. He said the protest has only been planned for a week but already 2,700 people have expressed an interest in the event and 700 say they plan to attend. On this trip Trudeau won't be sitting down with B.C. Premier John Horgan, whose government opposes the pipeline and has tried to put stumbling blocks in the way of construction. Trudeau has said several times that getting environmental protections in place hinges on also getting resources safely to overseas markets. That requires pipelines. As such, after pushing clean technology and oil spill protection in B.C. on Thursday, Trudeau is to fly to Fort McMurray, Alta., for a tour of Suncor's new oilsands facility there, and a meeting with oil company executives. The oil industry has been critical of the government for putting regulatory barriers to more development. Trans Canada Corp. last year blamed the demise of the proposed Energy East pipeline project on the government changing the rules for pipeline approvals. The Liberals recently introduced new environmental assessment legislation in a bid to prove it's possible to better balance the needs of the environment with the needs of the oil industry. That legislation, however, may allow oilsands developments to opt out of federal environment reviews, which Emma Pullman called ridiculous. Pullman, the campaign manager for advocacy group Sum of Us, said you can't be a climate leader and build more pipelines. Pullman understands the political quagmire Trudeau is in between the environment in B.C. and fossil fuel backers in Alberta but she said there are 18 Liberal MPs from British Columbia, all of whom could be at risk in the next election if the pipeline goes ahead. The Liberals won only four seats in Alberta in 2015. "I hear the challenge of that but I don't know how you build that pipeline and meet our climate goals," said Pullman.